Fire crews in Ealing are better prepared than ever to treat casualties at incidents, after being kitted out with life saving emergency care packs. 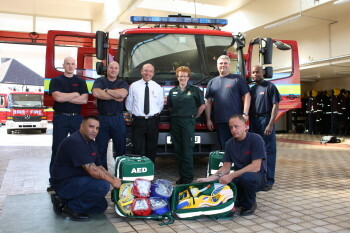 The new gear, called Immediate Emergency Care equipment, will be carried in a specially designed backpack on all fire engines at Acton, Ealing, Northolt and Southall fire stations. London Fire Brigade’s Borough Commander for Ealing, Sean Stark, said: “This new first aid equipment means that firefighters will be able to treat casualties who need urgent medical care until paramedics can take over. This could certainly increase the chance of a casualty surviving”. The IEC kit includes defibrillators, which are electronic devices used to establish a normal heartbeat, as well as other new items such as manual suction devices to clear blocked airways, stiff-neck collars, improved wound dressings and airway adjuncts, which help to maintain a clear airway in unconscious patients. The kit will be used when firefighters attend an incident that prevents early access for paramedics, such as blocked access or unsafe structures, or where fire crews are the first emergency service on the scene. It also allows firefighters to look after each other if the need to provide emergency treatment arises. The Brigade worked in partnership with the London Ambulance Service (LAS) to develop the training package for firefighters. This means fire crews will be able to provide emergency treatment to casualties to the exacting standards prescribed by the LAS. Pauline Cranmer, Ambulance Operations Manager for Ealing borough said: “Our staff are getting to patients quicker than ever before, but in these situations every second is vital so having first aid equipment available on fire brigade vehicles is excellent news for people in Ealing”.